Bert's CK Tutorials - Overload? Double Load!! *Update: 1 small additional setting needs changing on the script, see text for second to last image-block. Warnings of the dreaded Nav-Mesh bug that was a few lines down removed thanks to game updates fixing the nav-mesh!...mostly! 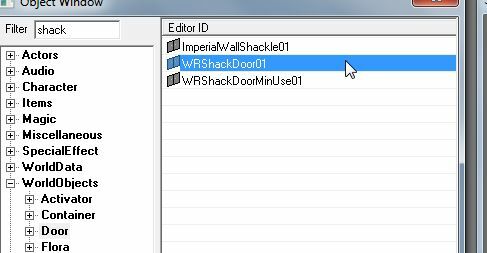 Ever crated a mod that you were very pleased with only to find that in-game every time you tried to exit the cell it crashed? converting the mod into an esm (tutorial to come! ), but this only raises the limit and very large mods can still reach it fairly easily! what I like to call "The Double Load Trick"
so the game engine only has to save your cell and load a tiny, practically empty cell, then save that empty cell and load the worldspace! the buffer cell to the outside world without you ever seeing it! 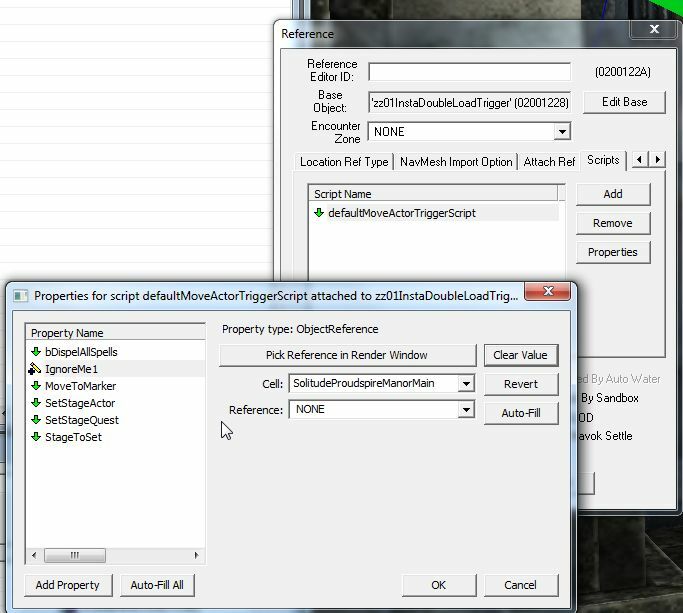 Skyrim.esm then click OK to create a new mod from scratch, or select your already built mod instead. 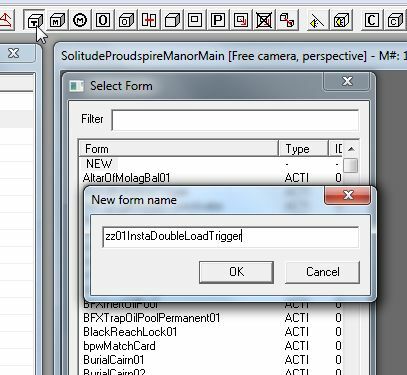 This creates an exact duplicate of the original cell with "DUPLICATE0001" added to the end of the name. 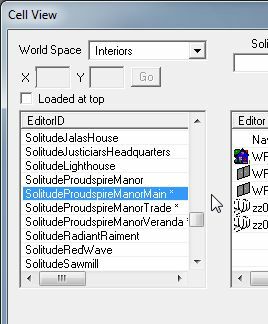 be close, but not identicle to the name for your actual mod, in this case it's the main entry to proudspire so, SolitudeProudspireMain. 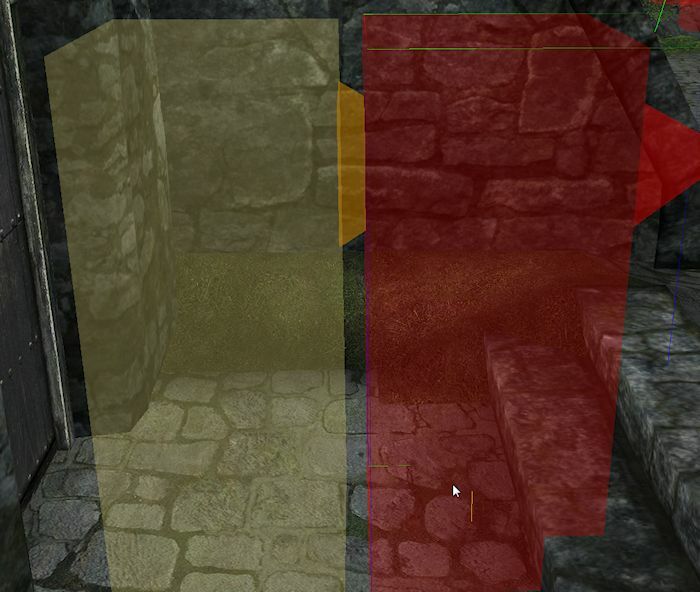 this case "Proudspire Main Entrance"
then scroll all the way to the bottom and while holding Shift select the last object. 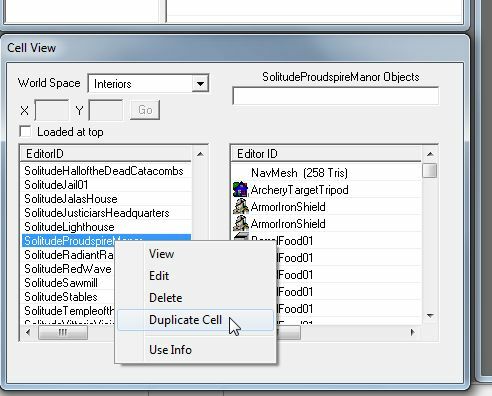 This will automatically select all the objects in between. skim through all the objects that require confirmation. that and hit delete and OK, switch cell and back again and now you have a completely empty cell! Now would be a good time to save!! 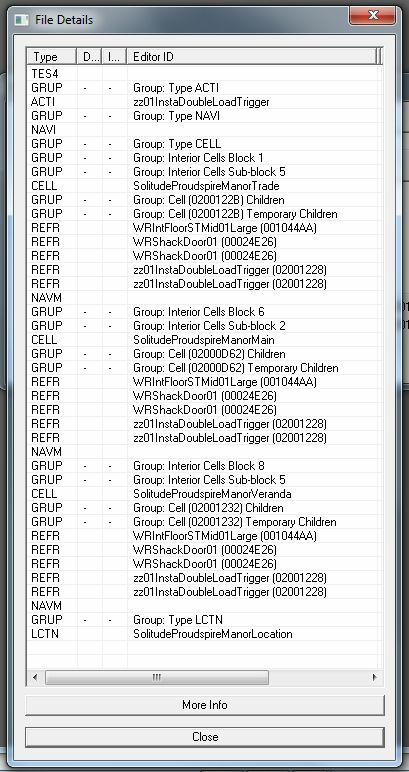 Now you have your empty cell it's time to build the double load frame work! 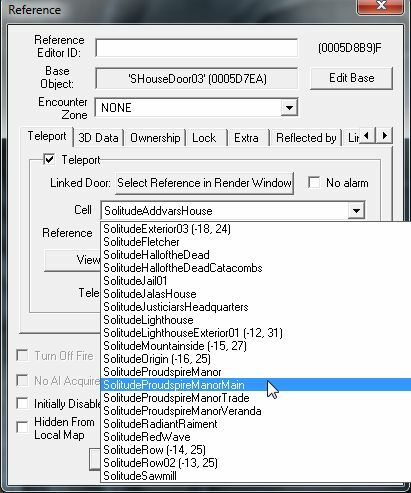 You can now double click your new cell to load it into the render window and you see..... nothing!! Which is correct because it's an empty cell! word "large" near or at the end of their names. These are twice the size of the avarage floor piece and will give you plenty of space to work in. them at either end of the floor, facing each other. have to cover the entire floor, just the space between the two doors. Now you need to create the triggers which will transport you directly to your destination without you even seeing this cell. 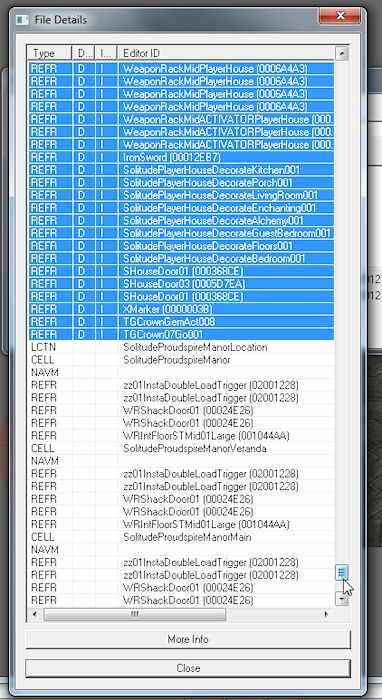 (I've gone for "InstaDoubleLoadTrigger") and click OK.
your options untill you can see the desired script. Select the script and hit OK and OK again to take you all the way out. 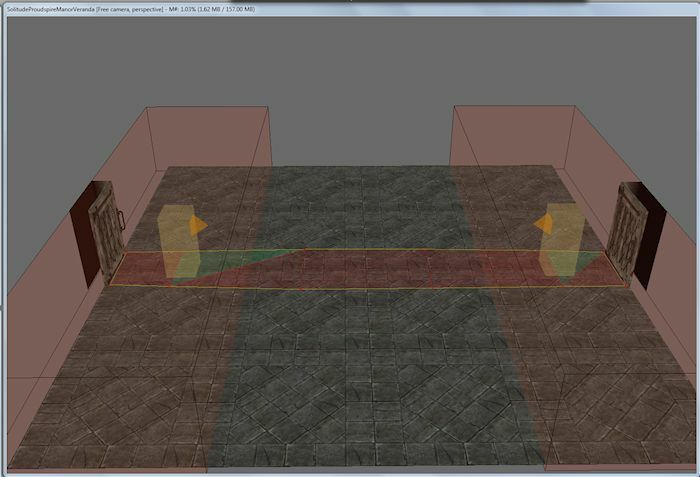 Now duplicate the trigger (Ctrl+D) and move the duplcate over the other end to cover the other door. 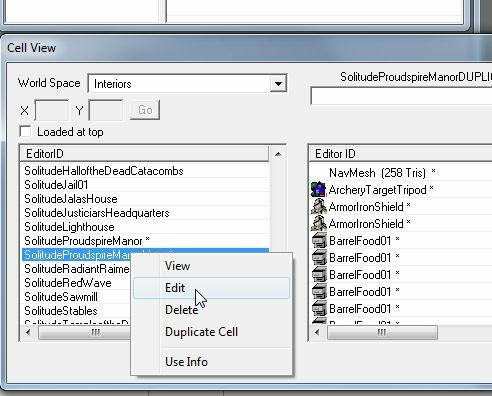 If your mod has more than one entrance you would now duplicate the the cell and give each duplication unique cell names and interior data names. For this example with Proudspire i've altered the names to: Proudspire Manor Main Entrance, Trade Entrance and Veranda Entrance. mods esp file and durring run-time will first generate all those objects then delete them, meaning more resorces being used and longer load times. mod but this time click the <Details> button. In the new window click the "D" on the top bar which you would see is the begining of the word "Deleted"
scroll down to the last with the "D" on it and holding the <Shift> key click the last to select all those between. reloading hit save. You now have a nice clean mod! Reopen the files list and check the <Details> again to be sure. 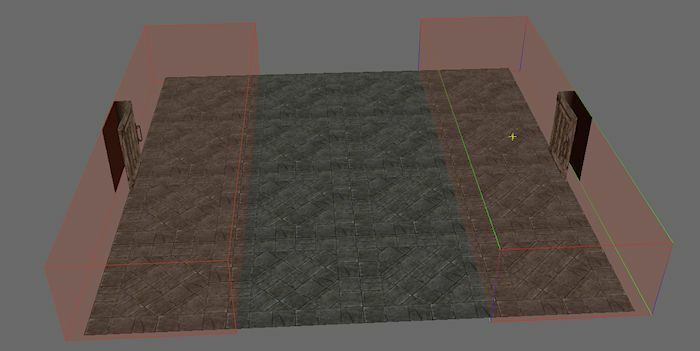 the coming tutorial: Lone Wolf Cabin, for now I will assume that you have an interior and exterior ready to go! Back from your tea break? Good, then we'll get the doors and triggers rigged! 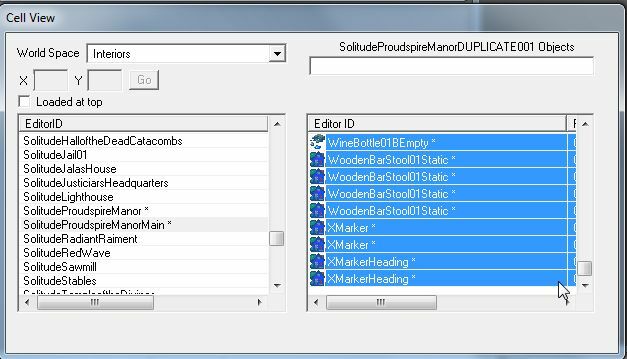 few letters of the name of the double load cell (for me, solitudeproudspiremanormain) and the box will autoscroll to what you type (I just type "soli"
matter which of the two doors are selected, one will always go in and the other out! the xmarkerheading (it's a big red verios of the yellow one!) 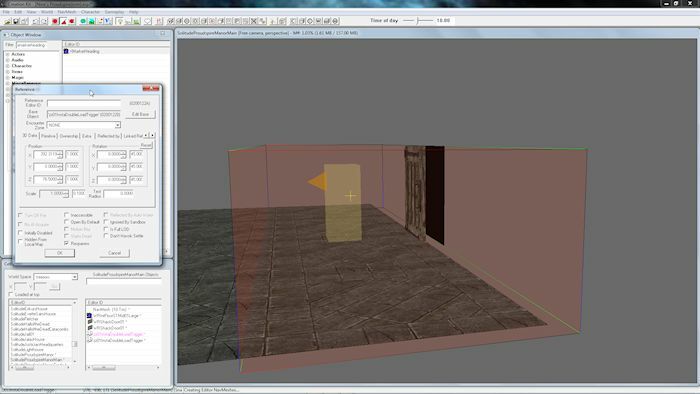 into the render window and rotate and position just in front of the yellow heading marker. This one doesn't need to be below the floor! do not finalize the nav-mesh!!!!! 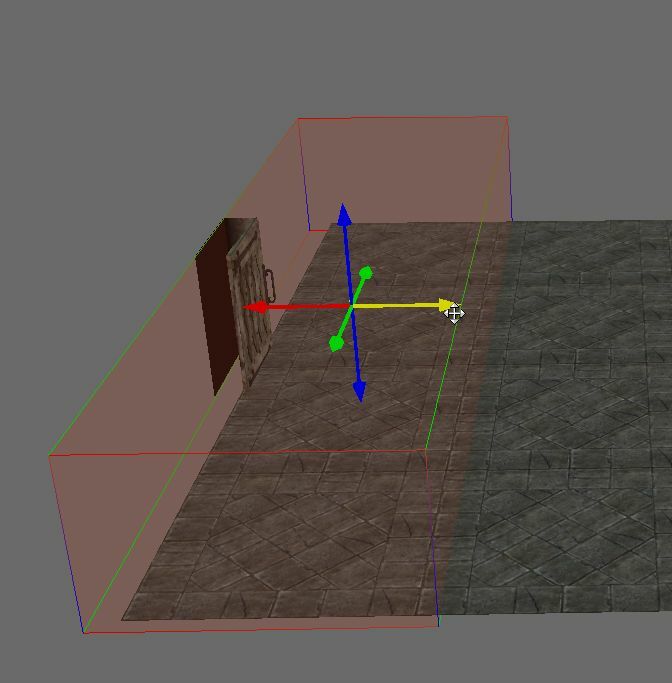 and position the two new yellow heading marker to face each other with their bottom edges juuuust below the floor and finalize the nav-mesh. 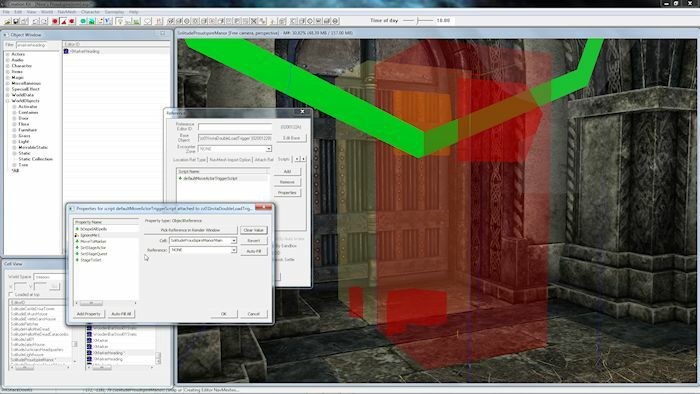 Now double click one of the large triggers and move the propertes window that opens off the render window. 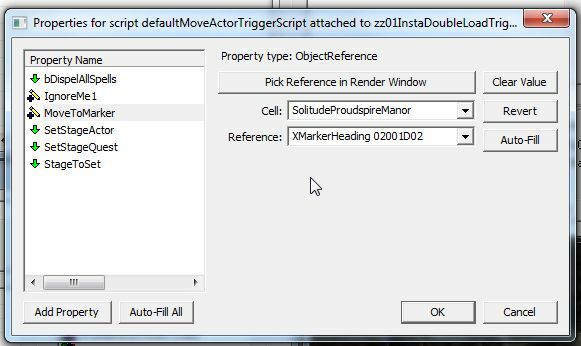 scroll along to the <Scripts> tab and select the script "defaultMoveActerTriggerScript" and click <properties>. Select <IgnoreMe1> and click <Change Value>. Thanks to Gentester for pointing this out! double click on the red xmarkerheading and all the needed info will be automatically stored in the appropriate boxes. All Done!! Save, quit and try it out! for figuring this one out! !